I was 7 years old the first time I stayed overnight with my great-grandmother, Ma. Ma didn’t live alone, but that night it was just the two of us in the big, rambling house that she shared with my grandparents. Mammie and Papaw were away on an overnight trip. I suppose they were concerned about leaving my great-grandmother alone while they were away, although I am still unclear on what exactly they thought I could do should something unforeseen happen. Yet there I was … Ma’s protector. It turned out that from that night right up until the fall I left for college, whenever my grandparents left town, it was my job to stay overnight with Ma. Typically, one of my parents would drive me up to the big house on the hill, where they would drop me off. I always tried to arrange things so that I would arrive sometime relatively in the early evening, yet late enough to have already eaten supper. Otherwise, all I might expect Ma to offer me would be a piece of dry toast or maybe some cornbread crumbled up in a small glass of milk. I knew that whatever my mother might be cooking that night would be immensely more appetizing than either of those choices. Still, I didn’t like walking in and going straight to bed. I needed time to get settled and maybe watch something on TV … hopefully, while my father visited with Ma for a bit. Ma was a worrier, and I liked for her to get all her worrying out with my dad so that I didn’t have to worry with her after he left. Besides, Ma firmly believed in that “early to bed, early to rise” business. I knew she was going to start turning off lights and shutting down the house about 8:30 pm. Bedtime in the big house came quickly. Being something of a night owl, I needed time to prepare myself for an early night. My father would go and there we would sit. Just the two of us, together in an oversized living room …alone in that big, dark house, sitting high on a hill. Those first few moments with my great-grandmother were always slightly awkward. We would look at each other and exchange small smiles, unsure of what to do next. Usually, at this point, Ma would ask me if I would like to eat an orange or an apple before bed. Most of the time, I did. She would heave herself up from the chair, and march off to the kitchen to fetch me a piece of fruit. A few minutes later, she would return with the fruit, a knife and napkins. Once she had settled back into her chair, Ma would carefully peel my fruit for me. Now, I could have certainly gone to get my own piece of fruit, and I could have even peeled it for myself. Nevertheless, I always allowed her to do these things for me … perhaps because whether she got me an apple or an orange, Ma’s method for peeling fruit fascinated me. With oranges, she peel off the thick skin so exactly that not a single speck of the white pith remained stuck to the juicy fruit. Oh, but watching her peel an apple was my favorite! Somehow she could cut one long, unbroken strand of peel away from the apple’s flesh, until it finally fell into a heap on the napkin in her lap. Many a night I sat transfixed, holding my breath, until she had made the final cut and the peel came away in a giant curl. As I ate my snack, Ma would talk. I personally preferred topic #1, which is why I learned very quickly that I could steer the conversation this direction if I asked her about that week’s Sunday school lesson. Ma loved to study her Sunday school lesson each week, and diligently read the scriptures to prepare for the class discussion. My favorite nights were when she would direct me to read the week’s passage to her from her large-print Bible because generally she would allow me to read aloud for as long as I wanted. In this way, I found I could easily keep the conversation from drifting to more unsettling topics … like death and hell. Death was probably Ma’s favorite topic, and she talked about it a lot. She talked about people who had died recently, or people she thought might be about to die. She talked about tragic deaths, not-so-tragic deaths, and her own death. The last one was her most favorite topic. However, as you probably imagine, I did not share her opinion. Now, Paige, you know there’s a good chance I could die in the night. It happens to people my age all the time. They go to bed and do not wake up in the morning. You should know that I am not afraid to die, but I worry you might be afraid to wake up and find me dead. So, if that happens, I want you to know there is no need to worry. Just call Malcolm. He will know exactly what to do. Malcolm, of course, was my father. I can assure you that if I had ever woken up to find Ma lying in her bed dead, I would have screamed so loudly there would have been no need to pick up the phone and call anyone, Malcolm or otherwise. Every time I every stayed overnight, Ma wanted me to share the bed with her. I always felt rather conflicted about this arrangement. There were quite a number of reasons I wasn’t sure I wanted to be in the same bed as her, the main one being the very concerning issue of her dying in the night. I wasn’t too keen on sleeping next to a dead person for any length of time. Secondly, my great-grandmother was definitely NOT used to sharing a bed. She hogged the covers, and made all sorts of strange noises. Finally, when Ma took out her dentures just before bed, it gave her face a strange sunken look … which, I hate to say, reminded me of what I thought a dead person might look like. Truthfully, I hadn’t seen many dead people at that time in my life, so I didn’t really know what to expect a corpse to look like. Sunken cheeks definitely could be something one might see on a dead body, so therefore it was another good reason to find another place to sleep besides my great-grandmother’s bed. However, the thought of sleeping in a bed all alone wasn’t exactly a comforting thought either. My grandparent’s house was rambling old home, with floors that creaked and doors that squeaked. Who knew what was lurking behind all those shadows or what creatures might be making those strange nighttime noises? Then there were large paintings of my aunts and uncles which hung on some of the walls. I had seen enough Scooby Doo episodes to know that large portraits sometimes have shifty eyes that actually hid some sort of terrible swamp monster. Yes, the more I thought about it, if something bad were to actually happen (like monsters appearing from behind portraits or burglars sneaking in to steal the stale cornbread from the kitchen counter), then it might be comforting to have another person in close proximity … even if that person made strange noises and had sunken cheeks and claimed she might die before the sun rose in the morning. Clearly, I had an overactive imagination. The truth is that the decision of whether or not I should sleep next to Ma was probably the hardest part of staying overnight with her. For the first few years, I generally slept next to her. After all, it seemed the safest choice. But by the time I was 10 or 11, I felt embarrassed about this sleeping arrangement. Yet deep inside, I was still very much a scaredy cat. I really didn’t want to sleep alone in a bedroom all by myself. I often resolved this problem by inviting a friend over to stay the night with me. But sometimes, I couldn’t find a friend to stay … and then I was left to work out whether or not I was brave enough to sleep alone. Once, when I was about 12 years old, I thought it would be nice to bring my younger sister Brooke along. Brooke is 4 years younger than me, and at that time we didn’t have a lot in common. But I knew she would stay up to watch TV as long as I wanted and I figured she wouldn’t complain about sleeping next to me in a bed. It seemed like the perfect solution to my sleeping dilemma! My father was the one to drop the two of us off that night. I recall him sitting next to Ma for a short visit. On this particular night, Ma immediately started complaining about every ailment she had or thought she might have. At one point, she started telling my father about how she was likely to die soon, perhaps even that very night. My father simply patted her hand and told her not to worry. Now Malcolm, you know I am not worried one bit about dying. I just want to be sure you know what to do in case these girls here wake up in the morning and find me gone. Now, I expect pretty quickly they will call you, so you will be the first to know. Then you should go ahead and call Ken and Greg. It doesn’t matter which of them you call first, but let them both know before you tell anyone else. Then one of you boys can call Herbert … but tell him not to rush home. I don’t want to ruin his trip, and besides there is nothing he can do here anyway. I guess you might want to call the preacher after that. And then, he quickly changed the subject. Probably to the topic of her Sunday school lesson. Half an hour later, my dad got up to leave. He kissed my cheek and called for my sister to come give him a hug. But Brooke didn’t respond. We both called. After several minutes, I finally got up to go look, but in that big rambling house, I couldn’t find her. Eventually, my father said he must go on home, and for me to tell her he said goodnight. I waved as he stepped through the kitchen door. But just half a minute later, Dad walked back in … grinning from ear to ear. I have found your sister. She’s sitting in the car with her overnight bag on her lap. She says that if Ma is dying tonight, she will not stay here for it. I’m afraid you are on your own. Ditched by my sister. Too late to invite a friend. I really was stuck in the big house alone with my great-grandmother … who seemed bound and determined to die on my watch. As I recall, I hardly slept a wink that night. The last time I saw Ma, she was lying in a hospital bed. Even though she was 91 years old, I didn’t think she was really going to die. After all, she was mentally sharp as a tack and every bit as feisty as I had ever seen her. Later, she drifted into a coma, and the next day she passed away. No drama. Nothing traumatic or tragic. Just a peaceful and quiet transition from earth over into heaven. What she longed for most of all, finally had come to pass. It’s been nearly 25 years now since the day she died, yet not a day goes by when I don’t think of her in some way or another. I miss the way she would pat my hand when she talked to me, or shake her finger in my face whenever she imparted some important truth. I can still see her face clearly: the big smile, the sly grin, the fiery look that made me want to hide. Oh … and her chicken pie! How I miss her chicken pie! When I finally get to heaven, I hope there’s an empty seat next to her at that great banquet table … because if there is, then the first thing I am going to do is walk straight over, sit down next to her, hold her hand, and tell her how grateful I am for all those nights the two of us got to spend alone together up in the big house on the hill. Fifty years ago today, my parents were married. My mother carried a red poinsettia. During that era, all brides carried a bouquet of white flowers. My mother wanted to have a white poinsettia, and had one ordered to be flown in from some far away location. On the morning of the wedding, the florist contacted my grandmother to say the white poinsettia had not come in and she wondered if a bouquet of white carnations be okay. No. My mother insisted it would not be okay. To begin with, she didn’t like carnations. And secondly, she wanted a Christmas wedding. Therefore, she would carry her Christmas poinsettia … and if there wasn’t a white one to be had, then a red one must do instead. When my grandmother relayed the message, the florist got extremely distressed. She fretted and fumed and retorted that it was not appropriate for a bride to carry any color but white. It would, she said, be sacrilegious for a bride to carry a red flower against a white dress. Yet, no amount of pleading could change my mother’s mind. So on this cold December night, the bride wore white and carried red flowers because as naturally sweet as my mother is, she can also be surprisingly stubborn at times, and on her wedding day she put her foot down over the issue of the bridal bouquet. My mother wore pink slippers beneath her white wedding gown. My grandmother was quite the seamstress. She insisted upon saving money by sewing her daughter’s wedding gown. One weekend, my mother put on the wedding dress for another fitting, and my grandmother mentioned that it was past time to pick out her wedding shoes so the hem could be sewn at the right length. And that’s exactly what my mother did. In her pink slippers with a red poinsettia in her hand, my beautiful mother walked down the aisle on her father’s arm to O’ Come All Ye Faithful. Half an hour later, maybe less, she walked out on my father’s arm to Joy to the World. In between, the organist softly played Christmas carols in the background. It was, according to my grandmother, a beautiful Christmas wedding. As a child, I used to look at the photos in my mother’s wedding album and wish I could have been there that precious night. I would stare for hours at the pictures of my aunts and uncles, all dressed up and looking like much younger versions of themselves. It was neat to see photos of both sets of my grandparents standing next to each other, obviously delighted in the marriage of their oldest children. And of course, I marveled at how my dad’s father looked more like my daddy than the grandfather I loved. And I hardly recognized the happy wedding couple, who were destined to become my parents. Yet, there they were … pledging their love and their lives to each other forever. But I didn’t need the photos to prove it. I witness them loving, serving and caring for each other, day in and day out. They loved each other well. And because of their commitment to God and to each other, I was blessed with grow up in a happy, loving home. So tonight, this post is written with much love for my mother (who is still the sweetest, most stubborn lady I know) … and with such precious memories of my dad (who adored my mother until the day he died and is still missed by us all). I cannot remember a time when I didn’t love Ritz crackers. My first Ritz memories are of eating them with peanut butter. I’m sure my mother made this delicacy for us, but I really recall enjoying peanut butter Ritz with my dad. In fact, when my mom was gone and my father was in charge of feeding the hungry horde of people left at home, you could count on peanut butter and Ritz crackers being on the menu. My father’s mother enjoyed experimenting with making treats dipped in chocolate. Her kitchen as filled with all sorts of sweets covered in chocolate. But her best creation might have been Ritz cracker peanut butter sandwiches which were dipped entirely in chocolate. Those were amazing! But really, if you ask me, a Ritz cracker can be topped with with nearly anything, and still be tasty: cream cheese, pimento cheese, spinach and artichoke spread. The list goes on and on. Yesterday was 4-H Fall Fest. Fall Fest is a big deal in our house. It’s a fun day of 4-H competitions, including lots of cookery contests. Each year, we start several weeks before Fall Fest looking for great recipes to enter into the various food categories. This year, Nathan and I found what we thought would be a winner: Creole Cheesecake Spread. This wasn’t your typical cheesecake dessert. This was more like a savory dip that was baked in a springform pan. It contained shrimp, crawfish tails, some Cajun seasonings and a whole lot of cream cheese. And all of this was baked on a Ritz cracker crust. When that baby came out of the oven, Nathan and I immediately spread some on top of a Ritz cracker. It was so amazingly delicious that we thought we had gone to heaven! Next, Nathan and I packed some of this Creole Cheesecake over to our neighbor, who is about as Cajun as they come and known all over Lafayette for his cooking skills. We asked his opinion. After he took a sample taste, he asked us for the recipe! WooHoo … we felt good about our chances at a blue ribbon. Would you believe Creole Cheesecake Spread didn’t even place? How is it possible for a Ritz cracker not to win? I am still not sure. However, my entire family enjoyed the rest of the Creole Cheesecake Spread while we watched the Saints games against the Bengals. I am happy to report that the Saints won … and the Creole Cheesecake was a winner with everyone too! This weekend I enjoyed a lot of Ritz crackers. I don’t keep them in my house very often, because if I do, I will eat them one long sleeve after another. I don’t have this problem with chips or cookies, but give me one Ritz and I’ll eat a dozen! I remembered a story my dad used to tell quite often about his days in Vietnam. Apparently, after he had been in Vietnam for quite some time, he went to the PX and discovered they had just received a shipment of new items to sell in the store. Among the new merchandise, my dad found a large tin of Ritz crackers. Even though it cost over $5, he bought it! He also got some peanut butter. My dad said it was worth every penny because it tasted like home. I always loved that story. Probably because I understood that particular story more than any of the other things he would share with us about his time in Vietnam. Anyway, between my dad’s birthday on Nov. 9th, Fall Fest on Nov. 10th and Veteran’s Day on Nov. 11th, I’ve been eating Ritz crackers and thinking quite a bit about my Daddy. Both have brought me a lot of happiness … though I enjoyed the memories of my father far, far more than the Ritz crackers. . Tomorrow, the leftover Ritz crackers will go into the trash. I’ll no longer be indulging in one of my favorite unhealthy foods. As much as I love them, Ritz crackers aren’t good for me. However, I’ll still continue to enjoy thinking about my dad. Not a day goes by when I don’t remember him in some fashion. And I plan on keeping it that way because generally whenever I think about my dad, it makes me smile. So in this Thanksgiving season, I’m grateful for my dad and the wonderful man that he was. And I’m glad that God thought up giving us brains that are able to remember and recall the past so that it can bring us joy. And every so often, I’m thankful for the enjoyment of a simple Ritz cracker … especially if it’s topped with a bit of peanut butter. I knew the rule about snooping through my parents’ room. I wasn’t supposed to do it. My mother said it was rude to go through other people’s things without their permission. I agreed with her reasoning. After all, I knew I would be livid if someone was poking around in my room, rummaging through the stashes of treasures stuffed back in various places. And yet, I did it anyway. Let me clarify. I didn’t pilfer through everything in my parents’ bedroom. I was mostly interested in their large chest of drawers. And truthfully, it wasn’t all of the drawers. Who cared about the ones crammed with socks? I was only interested in one drawer. The one that held all sorts of odds and ends that were clues about who my parents were before I existed, like my dad’s old tin box filled with tarnished 4-H pins and tie tacks that had no backs. There were other treasures too, like a seashell necklace my mom got when she met my dad in Hawaii during his R&R from his year serving in Vietnam. I suppose a seashell necklace might sound rather gaudy, but it really was a dainty necklace. The shells were tiny, all the same size, and a beautiful golden color. I longed to see my mother put the seashells around her neck, even though it was hard to imagine my mother wearing such a necklace. As far as I knew, the only jewelry she ever wore besides her plain silver wedding band were a couple of pretty brooches on the lapels of her Sunday dresses. Sometimes I would look at the photos of my parents enjoying Hawaii together and think about the necklace and wonder about the person she was before she became my mother. But the thing that drew me back to that forbidden drawer again and again was the sapphire ring. This ring is similar to the one in my mother’s jewelry drawer, the major difference being my mom’s ring had small diamonds interspersed among the sapphires. The photo is used with permission from the owner of Bejeweled Emporium Vintage Jewelry shop on Etsy. Truly, this was the most impressive ring I had ever seen in my short life. To begin with, it seemed absolutely enormous. The ring spiraled into a tall cone of sapphires, which were the deepest, loveliest blue imaginable. Their color reminded me of the blue that ringed the irises of my mother’s eyes. Interspersed among the sapphires were small diamonds, which glittered in the light. I remember that once my mother told me about the sapphire ring, stating that my dad brought it back to her from Vietnam. “Jewelry was cheaper there,” she said matter-of-factly. I was disappointed by her answer. Not because I didn’t understand her reasoning exactly, but rather because I wanted her to love the ring as much as I did. I wanted her to wear it anyway, even if there wasn’t a fancy party or grand occasion. Yet that was not my mother’s way, and so the beautiful sapphire and diamond ring was hidden away in the drawer. Throughout the years of my childhood, I continued to regularly dig around in my parent’s top middle drawer. The contents rarely changed, but that wasn’t the reason I went snooping around. The truth is I was drawn to that ring like a moth to the light. Each time I eased open that drawer, I would immediately pull out the ring, and put it on my finger. Often, I would go over to the piano and play a song or two, envisioning I was a grand concert pianist performing before a large crowd of people. Other times, I stood in front of the mirror pretending to be a model or a superstar posing for photographs. This was the most beautiful ring in the entire world. Someday this ring would be mine to keep. Neither turned out to be true … at least not in the way I envisioned. My great-grandmother, whom I called “Ma,” was a formidable figure in my life. She was a rather feisty woman, known for speaking her mind. She had an immense, intense, somehow fierce sort of love for her family. I was probably around 11 or 12 when I started sitting next to Ma in church. I didn’t want to sit with my parents anymore, but I knew they weren’t going to allow me to sit just anywhere. So I decided to sit next to Ma … at least initially because I knew she kept a stash of peppermints in her purse. At that time in my life, peppermints made just about any sermon better. This might sound strange, but at some point I realized that I continued to sit next to Ma because I loved to hold my great-grandmother’s soft, wrinkled hands and admire the rings on her long fingers. She always had on a thin gold band along with an amethyst ring in the shape of a flower. This amethyst flower ring is sold at Zales. It is very similar to the one my great-grandmother wore, only I recall that her ring had a gold setting and did not have a diamond center. Purple has long been my favorite color. As much as I loved my September birthday, I truly wished my birthstone might be the lovely amethyst rather than the sapphire. Sunday after Sunday, I sat next to my great-grandmother and admired her purple flower ring. Once my great-grandmother allowed me to try her ring on for size. As I stared at the ring on my own finger, I was captivated by its beautiful simplicity. When compared to my mother’s gloriously ornate sapphire and diamond ring, the amethyst flower on my great-grandmother’s hand seemed somewhat plain. Yet, I found it to be just as lovely. Maybe this was the most beautiful ring in the world. Christmas 1988 … give or take a year. My parents gave me a beautiful sapphire necklace. I was thrilled! While I preferred purple amethysts, sapphires were also among my favorite gems as it was my birthstone. My younger sister received an identical necklace, even though she wasn’t a September baby. It felt special for the two of us to have matching necklaces. This is the sapphire necklace my sister received that Christmas. My necklace was identical. What I once though to be the most beautiful ring in the world was no more. When my dad died 4 years ago, I found myself looking for ways to connect with him. I know it sounds strange … and maybe its just a way of grieving. You see, I knew he was no longer here with me, and I didn’t have any belief that he could hear me talking to him from the other side. As a Christian, I believe that because of my father’s faith in Jesus Christ when he died he went on to heaven to be with his Savior. And I don’t believe that he is up there looking down on me, or currently serving as some guardian angel in my life. And yet … I just wanted to connect to my dad. So I pulled out the sapphire necklace made from the sapphires he had brought to my mother from Vietnam before I was born. I thought perhaps wearing that around my neck would be a sweet reminder of my much-loved daddy. But when I pulled the necklace out of my jewelry chest, I immediately saw the chain was hopelessly knotted. I remembered instantly why I hadn’t worn it in several years. The super find gold chain had knotted like that in one of my many moves. Even though I had tried many times before, I wrestled again and again with the knots, attempting to make the necklace wearable once more. All of my attempts failed. For a long time, the necklace lay on the top of my dresser, near where I put my wedding rings every night. I noticed it nearly every day, and thought about taking it to a jeweler to have the fine gold chain repaired. But I never did. One day, as I had my wedding rings cleaned in the jewelry store, I noticed a beautiful sapphire and diamond ring in the shape of a delicate flower. I pointed it out to Jon. “My next anniversary gift,” I teased him. “Probably not this year,” he responded lightheartedly. But I couldn’t forget that ring. Six months later, I went back to have my wedding rings cleaned again. I looked, and to my delight, the sapphire flower ring was still in the glass case. Jon wasn’t with me, so I asked the sales clerk if I could try it on. It slipped perfectly on my finger. I did not want to take it off … but I did, somewhat reluctantly. That was in April. All through the spring and into the summer, I thought and thought about that ring. It cost about $500, a bit out of the price range for our lower middle class income to spend on birthday, Christmas or anniversary gifts. The more I thought about the ring, the more I wished I could figure out a way to afford it. I loved the sweet flower setting as it reminded me so much of my great-grandmother and her lovely amethyst ring. And the sapphires … well, they nearly perfectly matched the sapphires on my necklace. That was it! Instead of having the chain repaired, perhaps I could have those sapphires reset into a flower ring. I laughed … and then told her about my sapphire necklace at home. “How much would it cost to have those sapphires reset into a similar setting?” I asked. I was not willing to take the risk. But when I told Jon what I had been told, he suggested we visit another jewelry store that had an in-house jeweler to get a few estimates. So, one September Saturday, about a week before my birthday, Jon and I set out to talk with a jeweler. Suddenly I saw it too. The flower had been there all along! The new price was less than half of every other quoted cost, making it fall within the budget Jon had given me. I happily left my sapphire necklace with the jeweler and ten days later I picked up my beautiful new sapphire flower ring. My sapphire … to me, it’s definitely the most beautiful ring in the world. Even thought it really is a simple ring, I think it is the most beautiful ring I’ve ever laid eyes on. The sapphires are a deep blue. The ones my dad brought home to my mom from Vietnam. The flower setting reminds me of my great-grandmother, and all those times I sat holding her soft and wrinkled hands. Now every time I look at my right hand, I think about my daddy and my great-grandmother … and I am reminded that love between people doesn’t end with death. I also think about my husband who works hard to provide so well for our family, and yet didn’t freak out because I kept thinking about what must have seemed like a very frivolous thing. He could have shut me down. Instead, he was willingly to help me find a way to make it happen. And I’m reminded of how I desired something so much I was willing to search for it … and in the end, I discovered it had been with me all along. I suppose there is something profound in all of that. Or maybe it’s just a story that means something to me. I just know that the sapphire flower on my right hand is far more than a birthstone ring. It’s a visual connection to people I love … and a beautiful reminder that sometimes the things I desire the most are much closer than I ever realized. I was born September 17, 1972. I have always liked being a September baby. Well, for the most part I liked it. Both of my siblings had summer birthdays. They never had to think about going to school, taking a test, or doing homework on their birthdays. I have to admit that sometimes I would feel a slight twinge of jealousy about this. However, the truth is I generally didn’t mind going to school on my birthday. My elementary classmates sang The Birthday Song to me most years. Sometimes my friends brought me a gift to open on the playground. Other years, my mom would allow me to have a friend come home after school, especially if my birthday fell on a Friday. There was another reason I loved having a September birthday. It just so happened that both of my grandfathers had September birthdays too. My birthday happen to fall between their respective celebrations. Whether we were with my mom’s dad on September 5th or my with my father’s father on September 19th, I always got to be included in the birthday celebration. Everyone sang to me, and I got a set of candles to blow out. And since I was the only cousin (on both sides) with a September birthday, I always felt extra special. Looking back, it seems like nearly every year of my childhood I got to share a birthday party with one or the other of my grandfathers, and some years I was lucky enough to get two extra parties out of the deal! However, as much as I loved my birthday, the childhood version of me always wished for a September 16th or 18th birthday instead. The reason behind this longing is really kind of silly. Somehow in my childish way of thinking, 16 and 18 were more desirable numbers than 17. But obviously you are born on the day you are born, so there is no changing it afterwards. I am forevermore stuck with a September 17th birthday. Good thing that over the years I’ve learned to embrace it … mostly. Do you love reading the “On This Date in History” posts you see on social media? Or looking back at the headlines from the year you were born? Lots of good things have occurred historically on September 17th. Lord of the Flies was first published in 1954. Personally, I really disliked Lord of the Flies, which is why I included it on the list of bad September 17th events as opposed to the good list. It’s extremely hard for me to imagine that anyone could possible like this book. However, if by some strange chance you consider yourself a fan of Lord of the Flies, and if you feel inclined to correct my lists, then by all means feel free to comment below. I promise not to judge your sanity based on you love for this strange and disturbing novel. Back to my ramblings on the fascinating history of September 17th. There are lots of supposedly important people who happen to share my birthday. You know, like Charles the Simple, who was a Frankish King who ruled West Francia from 898-922. He was the third son of King Louis the Stammerer and a cousin of Emperor Charles the Fat. You remember King Charles the Simple, right? Yeah, me neither. There really isn’t much to say about Charles, other than the fact that he was apparently simple … although exactly how or why he was described as simple seems to be lost to history. Some historians actually prefer to call him Charles the Straightforward. No explanation for that either. No matter which name you prefer, old King Charles is relatively unheard of today … well, unless you are really into Frankish royalty. And my daddy. He died on September 17th, too. The death of a parent is a grief like no other. It’s a bit like being untethered. Like a newborn baby screams as it is forced to breath air for the first time, so our souls desperately cry when our parents leave this world. Like the final cut in the cord that has connected you in this world for as long as you have drawn breath is suddenly gone. How will we go on without them? It doesn’t matter if you are young or old. This is your parent. You’ve never known life without them, and now that they are gone everything you have known about this world seems to be unstable. 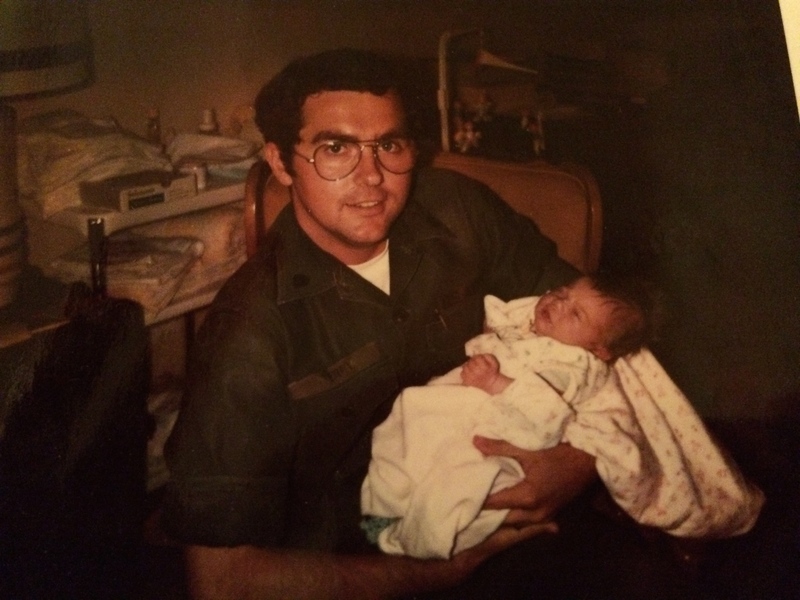 The unexpected death of my father coincided perfectly with my 42nd birthday. I’ve spent the last 4 years trying to make sense of that. I don’t want it to matter, but it does … at least for now. Perhaps not as much as it mattered last year, and not nearly the same as it did on the two years prior. Yet the pain is still present. How do you celebrate on the same day that you lost a person you loved so deeply since before you were really even you? How do you embrace joy yet mix it with solemn remembrance when the sting of griefs rolls around each year? I haven’t figured it out yet. Right now, September 17th is still a hard day for me. Grief anniversaries are real; my heart is just often sad around this time of year. And yet, his is my birthday. I want to celebrate … and, perhaps more importantly, people I love want to celebrate with me. Finding ways to acknowledge my sadness, because the anniversary of my daddy’s death is still a sad day for me. I am grateful that I know he waits for me in heaven. I rejoice over his eternal reward. I look forward to seeing him again. And yet, I miss him being here and I still sometimes grieve because he is gone. And then I am intentional about being creative as I plan ways to celebrate my birthday with my family and friends. This year, that included a trip to my favorite weekend Farmer’s Market, a little Saturday afternoon antiquing, and a small impromptu party. My favorite person in the whole world is taking me to lunch today after I spend the morning training as a volunteer counselor at our local pro-life pregnancy center (something I’ve wanted to do for a long, long time). I can honestly say it’s been a happy birthday so far. And I also know (thanks to God’s loving kindness and mercy) that whatever else today may hold, whether it is good or bad, I can trust that He will walk with me through it. With every year that rolls around, there is a September 17th. Some years good things have happened. Other years, it’s been a bad day. Some days are good. Some days are bad. Occasionally, you get a day where the good and the bad are mingled together. Perhaps the biggest mystery of my childhood revolved around green stars. Green stars meant something special to my parents. The mystery was that I never could figure out exactly what it meant. Occasionally, one of them would mention a green star in a passing comment. “Thanks for taking care of the dishes tonight! You deserve a green star,” my mother might say to my father. I guess he did, for several years later, I came across one in a box of my father’s old things … tie tacks with missing backs, lapel pins, random keys that had nothing to open, and that old wooded star now a rather faded shade of green. As random and rare as seeing a shooting star in the sky, green stars wove in and out of my parents’ relationship. Why were my parents always giving each other green stars? How come I never got a green star? All I really knew about the green star mystery is that it meant something good. And as a child, this drove me absolutely crazy. Do you remember the gummed foil stars teachers used to stick to schoolwork? I don’t think teachers give those out much anymore, but when I was in grade school every teacher had a box of star stickers in her desk drawer. The old kind you used to have to lick in order to stick. I loved those stars. I really liked getting gold ones. You had to do something really good to get a gold star … make a perfect score, have the neatest handwriting, not have a single spelling mistake. However, if I am honest, it wasn’t just the gold stickers I loved. Any color star stuck to the top of my paper made my type-A heart happy. Sometimes today when I see packages of star stickers in an office supply store, I have an urge to buy myself some. They aren’t gummed anymore. No licking’ and sticking’ these days. You just plop ’em down like any old ordinary sticker. I don’t think that would be nearly as much fun. Furthermore, even if I bought myself some star stickers, I don’t know what I would do with them. Stick them on top of the bills I paid each month? Mark my favorite recipes in every cookbook I own? Print out copies of my blog posts and give myself a star rating? I’m not sure star stickers have a place in my life anymore … but I wish they did. Last weekend, my mom handed me my father’s Bronze Star. I had gone up to help her for the day. We spent most of our time together, unpacking boxes in the dining room of her new house, placing her wedding china into the new china cabinet she purchased and organizing some serving dishes into the matching hutch. In the middle of all that unpacking, my father’s army medals came to light. How the Bronze Star came to be packed with the wedding china, I don’t know. Yet there it was, along with a few other army medals and a tin box filled with 4-H pins and a few other random items. In her nonchalant sort of way, my mother asked if I would like to take Dad’s old army medals for my boys. Naturally, I did. The truth is that I wanted them more for myself than I did for my boys. Somehow, standing in that room where my father never stood, touching those old army medals and 4-H pins … well, in that moment, it gave some sort of significance to my father’s life. Three years after his death, I still struggle with feeling as if he will fade away from me. I am often aware that I am grasping for the bits and pieces of what he left behind, as if it can bring him back or make him more real. Grief is strange like that. Anyway, it wasn’t until I got back to my home that I realized I didn’t know why my father received a Bronze Star. I knew enough from my days as a military wife to recall that Bronze Stars are a significant award not given to every soldier. What had my father done to earn it? All I could do was ask my mother. Maybe she would remember. So I sent her a text message, asking for any information she could share with me about my father’s Bronze Star. Yes, I know why your father got the Bronze Star. He distinguished himself during the war. He was never in trouble. He always did his job, going beyond the call of duty. He was diligent in doing his part to win the war. He got it for his meritous service in a foreign conflict. I read her words slowly. Two times. Three times. Over and over and over. So many times I actually lost count. As I stood there that night, thinking about my dad, I remembered how proud he was of his military service. But I couldn’t remember ever actually seeing his Bronze Star medal. Slowly I opened the worn black box containing the medal. And there it was, pinned to a piece of yellowed velvet. The star had tarnished green. My dad got a Bronze Star because he was a good soldier who strove for excellence. His hard work and diligent efforts were noticed. He stood out from the rest of the troops. And because of his good work, he was rewarded with a star. Just like I got those foil stickers pasted to the tops of my best schoolwork … the ones I worked the hardest on and gave my best efforts. Lots of gold stars added up to being on the Honor Roll. Even as a young child, I knew stars were a very good reward. Stars, whether the gummed sort given out by teachers or the bronze ones handed out by military generals, are reserved for those who excel. Nobody gets a star for mediocre work. When our time on earth is done, God will welcome us home with, “Well done, good and faithful servant.” (Matthew 25:21) These are the words every Christ-follower longs to hear. More than that, we are promised a crown. “And when the Chief Shepherd appears, you will receive the unfading crown of glory.” (1 Peter 5:4) Crowns we will cast at the Savior’s feet. Some days I think of my father in heaven… glorified body, worshipping the Savior, bowing before the throne. Maybe it’s silly, but I almost hope his crown was embellished with a big green star. It doesn’t matter though. My dad’s not wearing it. He’s already laid it at the Savior’s feet. Today is my birthday. Happy 44th to me. You see, today also marks two years since my father passed away … rather unexpectedly. I had only been awake about 20 minutes or so when the phone rang telling me that my dad had died. He just didn’t wake up that morning. I don’t want it to matter that my father died on my birthday. Even the day he died, I didn’t want it to matter. It still did, but I wished it didn’t. After all, my father would have never wanted me to experience any sort of emotional pain over him being called to his eternal home. Getting to meet Jesus face-to-face is a good thing … right? Even good things hurt sometimes. My dad used to tell me that after the first week of basketball practice back when I was in junior high. He was right. A lot of good things hurt … having a baby, getting shots when you are sick, sore muscles after working out, going through physical therapy to recover from an injury, and so on and so forth. Saying goodbye can be painful too. Especially if it is someone you love. Even if that person gets to go somewhere great. It still hurts the heart. So that gets me back to where I started. Not wanting it to matter that my dad died on my birthday. Only right now, today, on this birthday … it still matters. On this birthday when it still matters so very much. Just last night, Jon and I were once again talking about my birthday, discussing the details of the day. I have carefully orchestrated my day to ensure I won’t have much time to sit around and dwell on missing my father. Who wants to play the pity party game on their birthday?! Not me! So we have planned a day trip to visit with my mom and sister in a nearby city. We’ll grab some lunch at a Mexican restaurant (because I am craving guacamole) and then do some shopping (mostly the window variety). I’ve got a little birthday cash, so I am thinking of looking for a new purse … or I might save it so that I can buy the pendant and earrings to match the opal ring Jon bought me for my birthday this year. Yet, like I told Jon, I am still struggling inside. I have hard questions that my human heart can’t answer. Why did my dad have to die so relatively young? Why didn’t God allow him to see his grandchildren graduate high school, get married and have children? Why did God let him die on my birthday? What if something else terrible happens on my birthday? Allow me a moment to push pause right here and said that I married a great guy. One of the many things I love about Jon is that he doesn’t get upset when I share my thoughts. He just listens and lets me talk through all the emotion. That’s exactly what he did last night. He was quiet for a moment, allowing the heaviness of what he said and the weight of my own emotions to sink in deep. “Paige, let’s remember what the Bible says about our thinking and how important it is to our own well-being. What does God want us to think about? Well, He tells us. He said whatever is pure, honorable , just, pure, lovely, commendable, or excellent, we should think on these things. And why is our thinking so important? Because it is through our thinking that we have our minds renewed. And the renewing of our minds enables us to more fully experience God, to know His will, to see more of His heart. Experience the renewing of my mind. Ask what really matters most. Jon didn’t realize it last night (or maybe he did), but he gave me a place to start, a way to climb out of the hole of self-pity, a little bit of hope that maybe not all my future birthdays will feel so hard. This gift is better than any opal ring. Well, he honored and cherished my mother. He adored his children and grandchildren. My dad placed high importance on maintaining good relationships with people. He had a strong work ethic. My father loved to laugh. He enjoyed life and lived right up until the day he died. My dad was my friend as much as he was my father. Those are things that mattered about him, far more than the day he died. My father loved and knew Jesus Christ. And in the end, this is why I know I can grieve with hope. Because my dad had a relationship with God, the day of his death on earth was also his birthday into heaven. I know that for him, then end was really just the beginning of eternity. So does it really matter that my dad died on my birthday? Well, sure … but it’s not what matters most. And today, I am especially grateful for that. If you like, you can watch this YouTube video I made of some memories of my father. The music is the Theme from Rudy (The O’Neill Brothers). My dad was a sucker for sentimental movies, and Rudy was one of his favorites. Breakfast isn’t the meal you normal think of first when it comes to considering Thanksgiving Day festivities. But for 42 years, this was my family’s tradition … to gather together for breakfast. It wasn’t just any ordinary breakfast. To begin with, it was served outside, up on the hillside behind the house. Long tables were set up on the brick porch of the old wooden recreation building my grandfather had laughingly nicknamed “The Outhouse.” A couple of fire pits were strategically set around the yard, offering a place for groups to chat and warm up in the chilly morning air. Inside The Outhouse, the fireplace blazed, and next to it sat my grandfather in his chair holding court as he greeted all the guests. His family grew and so did the Thanksgiving Breakfast, some years numbering over 100 friends and family members. Perhaps because he was an only child, my grandfather loved having his family and friends (who he considered to be family) close by, especially on holidays. Thanksgiving Breakfast was no exception. My own father often complained that his dad would continue inviting more guests right up until the very last minute, making it hard to know how many people we were actually cooking for. But that was part of what made it so wonderful is that anyone who wanted to be there could come, invitation or not. The rest of the family members made treks, up and down the brick steps, back and forth from The Big House to The Outhouse, carrying delicacies like Monkey Bread and large pots of piping hot grits and trays filled with slices of ham or turkey or even sausage. It was early in the morning that the first guests started arriving. By 7:30 am, the driveway was crowded with cars and the chatter of voices carried all over the hillside. For the next two hours, everyone would huddle together in small groups, mugs of steaming coffee or hot chocolate in one hand and a plate piled high with biscuits, eggs and warm cinnamon rolls in the other. Laughter could be seen and not just heard as every breath hung in the air like tiny puffs of smoke. Hugs were as plentiful as the food. Every year, Thanksgiving morning was a morning I wished would never end. Eventually though, the crowds would depart, each friend or family member headed home to prepare for other Thanksgiving meals later in the day. Those of us left would clean up The Outhouse, throw away the trash and put away the food. My brother and cousins would pile plates high with the extra food, then head out to make deliveries to a few elderly shut-ins and other folks my grandfather thought might appreciate being remembered with a plate of food. Since 1973, this is the way every Thanksgiving I can remember went. Seeing as I was born in 1972, this is truly the only sort of Thanksgiving I have enjoyed. And a part of me believed it would go on forever. But my grandfather died this past spring … and after a lot of discussion, it was decided that Thanksgiving Breakfast had reached its natural end. This morning, I woke up at my mother’s, our Thanksgiving meal over as we had celebrated on Wednesday night. We set about taking care of other chores, mainly beginning to decorate The Big House for Christmas. Mid-morning, my mother sent me to The Outhouse to look for her missing step-ladder, which we needed to hang up the stockings. Without thinking, I headed to the back door, opened it up and stepped onto the brick steps leading up to The Outhouse. The morning breeze caressed my face, and without warning I heard the echoes of 42 years worth of thankful hearts gathered on that hillside, which now seemed strangely silent to my ears. As I neared The Outhouse, I passed by a cold fire pit, but I could nearly smell the smoke wafting in the air. As I opened the door and let myself inside, I heard the sizzling of the hot cast iron skillet. I felt the heat of fireplace. I squeezed past the shoulders of guests to get closer to my grandfather’s chair. Only no one was there. The fireplace was not roaring with a fire. Nothing was cooking. Tears began to form in the corners of my eyes, threatening to fall. The back of my throat burned hot. The weight of the end of something loved and good felt heavier than I expected. Then, I remembered the step-ladder and why I needed it. Down in The Big House, I needed to hang seventy stockings. They hang along two walls in the over-sized dining room of The Big House, a band of colorful felt. No two are alike. Each one handmade. The stockings are as unique as the individuals they represent. A marriage that lasted 60 years.Five children. Thirteen grandchildren. Thirty-five great-grandchildren. It’s not just DNA either, for in that seventy are adopted children, step-children, and foster children. This is the legacy my grandfather left … not money or possessions or even beloved traditions. But people. He loved big and he always had room for one more at his table, whether it was for coffee or Sunday dinner or Thanksgiving Breakfast. Today I’m thinking about my family and our traditions … and I’m grateful for my grandfather and his legacy for it reflects something in God’s nature too. God loves big. In fact, His love is the biggest there is. And He always has room for one more. Some day in heaven there will be a great banquet. A feast to end all feasts. Thanksgiving Breakfast will pale in comparison! And I wonder about the table. How wide and how long it will be! Even so, at God’s great table, there is always room for more. Let’s you and me agree to bring another guest to breakfast. When my Aunt DeDe’s number came up on my caller ID, I was happily surprised. Not only is she one of my favorite people in the world, but I hadn’t spoken with her personally since my dad died a year ago. Phone calls to Africa, where she was serving as a Southern Baptist missionary, weren’t something I made or received. My only contact with her for two and a half long years had been a blog and Facebook updates. Late in the summer, Aunt DeDe had returned to the states. It seemed that everyone in the family had gotten to see her except for me. And now she was calling me … and was about to make me an offer that would be just as pleasantly surprising as the phone call itself. Tears sprang to my eyes. From the time I was a little girl, I had thought my grandmother’s Blue Danube china was the most beautiful set of dishes I had ever seen. For as long as I could remember, my grandmother, whom I called Mammie, kept her china in a massive antique display cabinet that had once been part of an old drugstore. 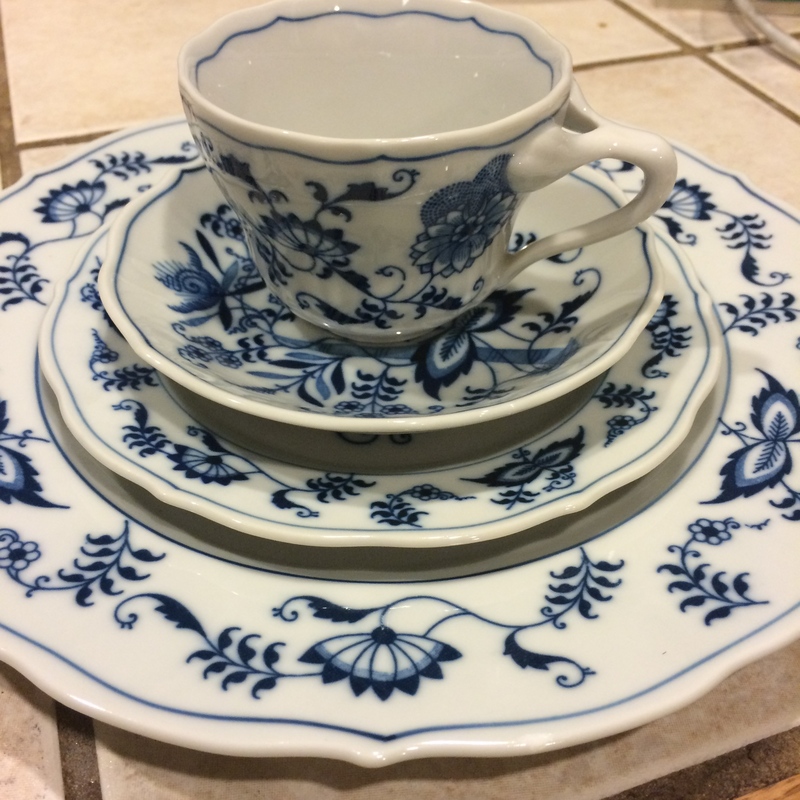 Back at the turn of the twentieth century, the old cabinet with sliding glass doors had neatly displayed ladies’ gloves and men’s handkerchiefs; now it overflowed with my grandmother’s trinkets and treasures … and all of that beautiful blue and white china. There were dinner plates, salad plates, coffee cups and saucers. Each year, my grandfather bought her some new piece of her beloved china, accessories like platters of various sizes, vegetable bowls and covered casserole dishes. Perhaps most intriguing to me was the large soup tureen, with a matching china ladle. Though I never remember her using it, I always hoped someday she would. I suppose there were just far too many of us in the family to make it practical to serve soup out of that soup tureen. Mammie didn’t use her china on a daily basis. Rather, it was reserved for special occasions and holidays … Christmas mainly. Oh, how I loved her Christmas table! Each seat had a perfectly arranged place setting directly in front of it. One year, perhaps when I was 8 or 9, my grandmother invited me to come up and help her lay out the table a few days before Christmas. I remember the enormous weight of responsibility I felt as I gingerly carried the delicate dishes from the large cabinet to the long dining table. The last thing I wanted to do was break one of those beautiful plates! 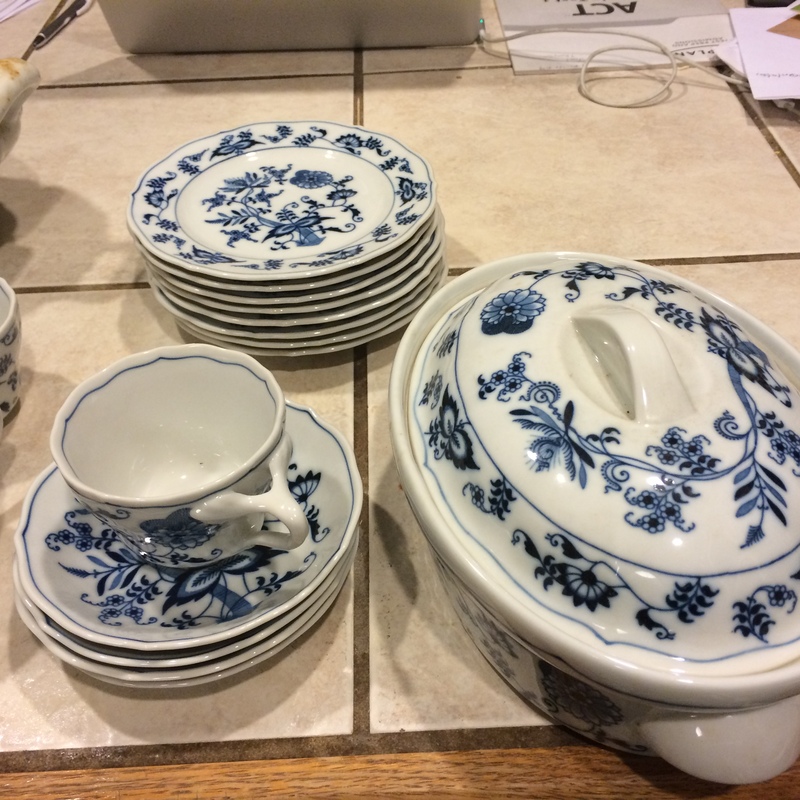 One year, maybe when I was in high school or college, some of my aunts decided that it was too much work to pull out the china for our Christmas dinner. They claimed it was nothing more than a hassle to set the table only to have all those dishes to wash afterwards, and really no one wanted to be stuck in the kitchen, carefully hand washing all those china plates and cups, when they could be out enjoying the holiday with the rest of the family. I certainly understood the reasoning behind the decision to forego using the fancy china in favor of the large oval Chinet paper plates. Yet, after that, Christmas never felt quite as magical as it did when the table was so beautifully set with my grandmother’s best dishes. I assured her that whatever she gave me would be more than fine. After all, I never expected to have even the first piece of that china. That was early August. It wasn’t until the Saturday before Labor Day that I managed to go visit Aunt DeDe and pick up the boxes. And another week passed before I had a chance to unpack and sort through the contents. Seven china plates, eight salad plates, three coffee cups with saucers, one medium-sized platter, a vegetable bowl and a small casserole dish with a lid. Most surprising of all, the large soup tureen with the matching china ladle. “Where will you put it all?” Jon asked incredulously. This wasn’t the first time he had asked me where I intended to store all of my grandmother’s dishes. “I don’t know.” The kitchen looked like it had exploded plastic shopping bags, the packing material my aunt had liberally used to cushion the dishes. Countertops were covered with dishes. My kitchen cabinets were already full, and I didn’t own a china cabinet. As I pulled the final pieces from the boxes, it occurred to me that I had space in the large floor-to-ceiling storage cabinets that were in our back entry way, next to our second refrigerator. Just for special occasions and Christmas. This week marks a year since my father’s unexpected death. The last few weeks, my emotions have been all over the map. I probably have cried more in the past month than I did in the first month following his passing. In many ways, the pain feels heavier now than it did initially. Part of me is surprised by that. But, perhaps what startles me most about these delayed emotions is how much I find myself missing my grandmother, as well as my father. Up until a day or two ago, I didn’t even realize how much I had been missing my grandmother. She’s been gone eight years now, nearly nine now … though Alzheimer’s took her long before that. I know it’s been longer than a dozen years since I heard her laugh. Perhaps it’s even been 15 years. I can no longer remember when she slipped away. All I know is that Alzheimer’s is the great stealer, taking a person away long before their death. By the time my grandmother actually stepped through the gates of splendor, all my tears had long been cried. At least I thought there were no more tears left. But this past weekend, as I put the last of her blue and white dishes in my hallway cabinet, I found myself wiping away tears. Later, in the shower, I cried hot tears of grief … a grief so intense I wasn’t quite sure where it was coming from. Was I crying because I missed my dad? My grandmother? I couldn’t tell anymore. All I knew was the deep ache in my heart from a longing to see these people I had loved so dearly. When someone you love dies, people will tell you to give yourself a year. “The first year is the hardest. Once you get through all the firsts without your loved one, things will begin to get easier,” they say in hushed tones, as if somehow this is a comforting thought. Maybe that’s true. I can’t exactly argue the point. But personally, I am more inclined to think that grief is much more unpredictable. In my experience, waves of grief come and go, like tides moving in and out along the ocean’s shore. It doesn’t ever stop, though at times the tides of sorrow are lower and calmer while other days it feels like a wild hurricane threatening to drown everything in its path. Thursday marks one year since my father passed away. I suppose, it makes sense that this week would be one of intense emotions. In fact, I’ve been anticipating the tide would shift and the waves of grief would begin to roll in higher as the year of firsts without my father drew to a close. And it’s proven to be true, as dreams of my father have been more frequent and tears have fallen from my eyes more freely during these last few weeks. Thursday is also my 43rd birthday. Last year, at my father’s funeral, someone commented to me, “My heart hurts for you especially, Paige. Not only did you lose your father, but now you will never again have another happy birthday!” Those words stung, like a slap in the face. It’s wasn’t just the thought have living with such lifelong sadness , but also knowing that my father would have never wanted me to grieve over him like that either. After all, he is now more alive with the Lord in heaven than he ever was when he walked upon the earth. Still in those first days and weeks following my dad’s death, as I mulled over how I would handle my future birthdays without succumbing to overwhelming feelings of sadness, the Holy Spirit gave me an answer that I never expect. And idea to solve my predicament that I certainly could never have come up with on my own. My birthday on earth and his birthday into heaven. From tangible blessings, like my grandmother’s dishes and a birthday vacation to Virginia to visit old friends, to comforting thoughts like sharing birthdays on earth with a loved one’s birthday in heave, my precious Jesus meets me in my grief and is my strong anchor whether the tides of emotion are high or low. The reminder of this truth has been my greatest blessing during this past year.